Energy costs are sky rocketing, so finding easy and inexpensive ways to save energy should be at the top most homeowners to do list. Since heating and cooling your home accounts for over 40% of your total utility bills, it is important to get the most out of your equipment. One of the ways you can help your central air conditioning perform more effectively and efficiently is by installing a programmable thermostat. 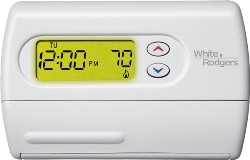 There are many different types of programmable thermostats and it is easy to find the right one for you situation. Most families have a varied schedule each week – different hours that you are home Monday – Friday; and separate hours on the weekends. This is where a 5-1-1 thermostat can help you make the most of your air conditioning system. In this DIY Reviews Home Improvement article, we will outline the steps to take in order to install a programmable thermostat in your home. This can be a DIY project for most people that are handy with tools, but if you aren’t feeling that confident, you should contact an hvac contractor in your area or find an electrician to come out and install it for you. Turn off all power at main electrical panel: To be completely safe, you should turn off all power at the electrical panel. Some people will only shut off the power to the particular room or the thermostat itself, but we advise against that. Take off the old thermostat cover: Most covers will just snap off. Try not to break it while removing in case something goes wrong with your installation and you need to put it back on. Remove the Wire: If the wires that you are removing are not color coded, you need to mark them yourself. Do this by applying a piece of tape to the wire and mark it with the letter of the terminal it screws into. Remove old thermostat: Remove screws that are holding the thermostat to the wall. Make sure you don’t allow the wires to drop back into the wall during this process. If you need to, tape them in place to make sure they can’t slide. Take the thermostat off the wall. Reattach the wires: This will probably be the most difficult part of your thermostat installation and one where the directions that came with your thermostat should come into play. Screw all of the wires to their terminals per directions. Install the batteries. Attach control panel and face plate: Before completing this step, write down the wires you have attached (C, G, Y, R, etc.) because you may need to know them to program your thermostat. Turn power on and program the thermostat: This step needs to be completed per manufacturer instructions. The basic rules for programming a thermostat in the summer are that you will want to let the temperature in your home get warmer at night and when you are at work. You can program it to start cooling down again 30 minutes before you return so you have a nice, cool home to walk into. During the winter, you will reverse this procedure to have your home colder while you sleep and are at work, and warm it up before you return home. As we stated before, this can be a DIY project for most homeowners that are fairly handy. 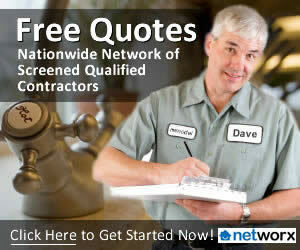 Just remember that if at any time you think you are in over your head, you should call a professional to help! Have you installed your own thermostat? Comment and share your tips! 49 DIY Tips to Big Energy Savings!